Oz, when I read your comments about synchronicity and the lady from Sandusky, I was in Sandusky, which is where I work. Very interesting, Oz. 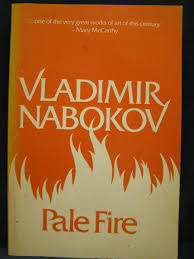 As I wrote in my last entry to the reading group series, the most important critical study on Pale Fire, Brian Boyd's "Nabokov's Pale Fire: The Magic of Artistic Discovery," argues that the book was written by Kinbote under the influence of John Shade's and Hazel Shade's ghosts -- e.g., under the influence of people who had gone into the bardo. Interesting theory, thanks Tom. Terry Gilliam felt that the departed spirit of Heath Ledger helped him finish "The Imaginarium of Dr. Parnassus" after Ledger's untimely death. Gilliam ended up crediting it as a Ledger/Gilliam film.